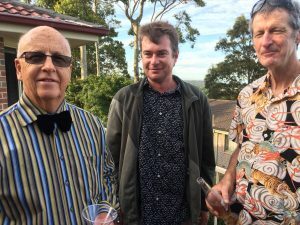 January 2018 – Narooma Rotary Club Inc. Many of the Rotarians responsible for the Busking Festival and the Renewable Energy Expo. 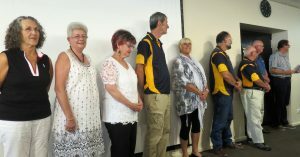 It started last Thursday evening with the Narooma Australia Day Awards. It was great to see a good turnout of Rotarians at the function. Rotary was recognised for its contribution to the community as well as the Busking Championship and Renewable Energy Expo. It was pleasing to see Laurelle recognised for her contribution to many community organisations, especially Narooma School of Arts and Rotary. 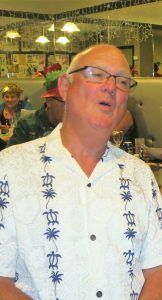 On Friday morning we awoke to the news that a former member and Past President, Terry Irvine received an OAM in the Australia Day Honours Awards. A wonderful achievement for Terry and justified recognition for his contribution to pharmacy over many years. It was also pleasing to note that Marg Saker, a former Narooma resident and active member of Quota, also received an OAM. 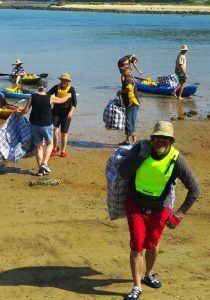 David McInnes and our merry crew of kayakers tasked with duck retrieval. At 9 on Friday morning we headed to Narooma Bridge for our annual duck race. Despite all the changes to the start time because of the president’s inability to read a tide chart, we had an excellent crowd turn out to watch the launch and race. I must say it was one of the best contested races I have seen with most ducks sticking to the main channel rather than taking detours under the boardwalk. The winner was from Safety Beach in Victoria and the last place went to a Wagga resident here on holidays. Saturday saw Narooma Motors’ Fourth Annual Car Show on NATA Oval. A large variety of fancy cars were on show and a wonderful crowd turned out to check them out. Congratulations to Narooma Motors on a great event. The food van did a roaring trade feeding the crowd with sausages, steaks and bacon and egg rolls. Lynn reports that we took $1199.00 on the day. Sunday saw us front up again at NATA Oval, this time for our January market. We had an excellent roll up of stallholders and all looked good for a bumper market. Unfortunately the rain started to tumble down about 8:30am dumping approximately 40mm on the oval, causing us to call the market off at around 10:00am. Of course, the sun came out about an hour later and those stallholders who stuck it out seemed to do well. We took $1,575 at the gate and ended up with $159.80 in the van after some of the food was paid for out of the till. Unfortunately we had a lot of food wastage. We will offer some stallholders a credit towards our February market. Frustrations at our Market last Sunday with rain that was not forecast disrupting the market. Our barbecuers though were not daunted. Thank you to everyone who helped out during the week. There are too many to mention here, however please be aware your commitment to Rotary is appreciated. Don’t forget it’s back to our meeting schedule this week with our normal ‘Rotarian Presents’ night followed by our dinner meeting at the Club. Laurelle will start us off at Mill Bay at 5:30pm with a short stroll along the Boardwalk looking at some of our local history along the way. We will then move to the Club for dinner at 6:30pm. 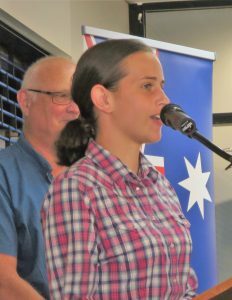 Our 2018 Rotary Tertiary Scholar Alicia Bate with President Bob at the Australia Day presentations on Thursday. Alicia Bate has been awarded the 2018 Narooma Rotary Tertiary Scholarship. In announcing the award at the Australia Day presentations last Thursday, President Bob spoke about the bequest that makes the $9,000 scholarship to a student from Narooma High possible. Alicia is the 28th student from Narooma High who has benefited from this bequest, assistance that now totals almost $240,000. Alicia has deferred her studies in Animal and Veterinary Science at Charles Sturt University for a year so she can undertake a bovine embryo transferring course in the USA. Lynda Ord said the interviewing panel was particularly impressed with the fact that she organised the course, her accommodation and work experience at a vet clinic through a number of contacts in Australia. Next year she will start a Bachelor of Animal Science and then hopes to transfer to a Bachelor of Veterinary Science/Veterinary Biology. She was unable to defer a Veterinary Science course so accepted a place in Animal Science instead. The winning duck 208 was held by Melanie Reid of Safety Beach in Melbourne, who won $1,000. The last duck was 543, held by Tamara Prowse of Wagga Wagga who won $100. President Bob presented the cheques at Narooma Motors’ Car Show on Saturday. Proceeds from the race will go towards Australian Rotary Health and the Club’s Tertiary Scholarship fund for students from Narooma High. Donations will also be made to Narooma Surf Club in appreciation of their assistance and to Bermagui CRABS (Cancer Research Advocate Bikers) who lend us the ducks. Please meet at the Mill Bay end of the Boardwalk ready for a 5.30pm start. Some of you might like to organise a car at the netted beach car park, rather than walk back to Mill Bay. The walk will end at the netted beach. I am looking forward to sharing with you some aspects of Narooma’s fascinating history. We had a great evening on Saturday. 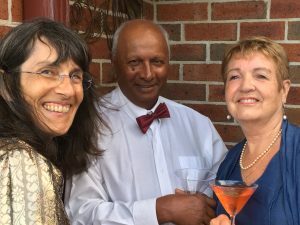 It was wonderful to see so many people attend our cocktail night; attire ranged from the very formal to the relaxed coastal style. We welcomed Gordon Bentley, his wife Di and son Scott as well as Neil and Gloria Jenkins and their daughter, Andrea as guests. Di Bentley won the lucky door prize, taking away a door that is sure to bring her luck during 2018. Other raffle prize winners included Neil Jenkins who won a Santa biscuit barrel, a couple of bottles of beer and a pair of scissors. Rolf won a wonderful leather chair that he refused to take home; Frank won a ‘Revenge of the Nerds’ DVD and John Doyle won an empty box. Thank you to Therese, our daughter Jen and to Therese’s sister Ruth who kept the food and cocktails flowing, without their help the night would have been pretty dull. As members know we have a busy week ahead with the Australia Day Awards on Thursday evening. We are in the running for the community event of the year and we will also announce our 2018 Tertiary Scholarship winner. On Friday the Great Annual Duck Race will take place with ducks racing from the bridge to Apex Boat Ramp. We have decided to start the race at 9:15am due to the tides, so please come along and help out if you can. All tickets have been sold, thank you to all who helped selling tickets, especially, Michael and Ang who sold the bulk of the tickets. Please don’t forget the Narooma Motors’ Car Show on Saturday and the Markets on Sunday. I understand John Doyle has most roster spots covered; however, additional helpers are always needed. Our normal meetings start again on 1 February with Laurelle Pacey taking us on a history tour of the Boardwalk. Please be at the Mill Bay end of the Boardwalk at 5:30pm, after the talk we will head to the Golf Club for our normal meeting. We will hold our Annual Youth Night on 8 February. Lynda Ord encourages as many Rotarians as possible to come along and support the Australia Day Award presentations on Thursday 25th at Club Narooma at 6pm (Note change of venue and time). It is a prestigious time for ourClub what with the announcement of our Tertiary Scholar and a possible Australia Day Award. Some members will also be singing in the Community Choir. Race organiser John Doyle and President Bob have changed the start of the Duck Race to about 9.15am to fit in with the tides. All the markets posters have a bit about the Duck Race at the bottom, so if you see one around town please change it to 9.15am. The ducks will be launched from the bridge at about 9.15am on the 26th and then proceed downstream towards the finish line at Apex Park boat ramp. The first duck across the finishing line wins $1,000. The last duck wins $100. 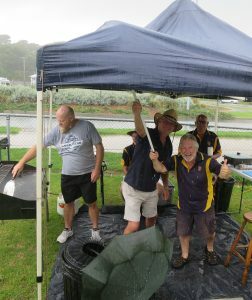 Proceeds will go towards Australian Rotary Health and the Club’s Tertiary Scholarship fund for students from Narooma High. Donations will also be made to Narooma Surf Club in appreciation of their assistance in recovery of the ducks and to Bermagui CRABS (Cancer Research Advocate Bikers) who lend us the ducks each year. Narooma Motors will host its Annual Car Show on Saturday 27th on NATA Oval. We will be helping out with the food van. Cars will be coming from many car clubs. The gates open to entrants from 7am. For non-entrants the gates open from 9am. 2EC will broadcast from 10am. Entrants close at 12.30 so judging can be completed by 1.30. Prizes will be handed out before 2EC’s Kimmy Saker departs at 2pm – 10 trophies and cash prizes. There will be face-painting, balloons and a jumping castle for the kids, prizes and giveaways. The Markets this Sunday 28th promise to be even bigger than the December markets. President Bob gets into the Christmas Carol spirit at our Christmas party. Welcome to 2018! I hope each and every one of you had a great Christmas and a relaxing start to the New Year. 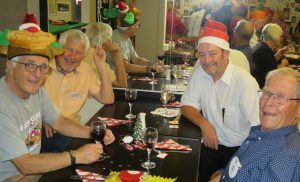 Some of the many happy faces at our Christmas party – Michael O’Connor, Peter Hartley, Rolf Gimmel and Mal Gray. 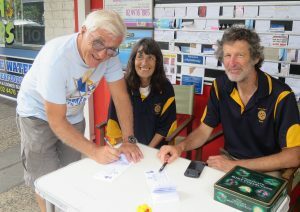 As always seems to be the case, the year ahead looks to be a busy one for Narooma Rotary. Take January for example, with Australia Day Ceremonies, the Duck Race, Narooma Motors Car Rally and our monthly markets all to take place over the long weekend – please help if you can. To ensure that we have a bit of fun to get us in the mood for a good 2018, don’t forget this week’s cocktail party at our place this Saturday from 6pm. It will be a great night with interesting cocktails, mouth-watering’ mocktails’ for the non-alcoholic drinkers, beer and wine, and top class entertainment. I encourage you to dress in bright cocktail wear. The cost will be $20 per head and will include drinks and finger food (there is no need to bring any food). Therese and I are looking forward to seeing you. Please let me know if you, your partner and friends will be coming by this Thursday. 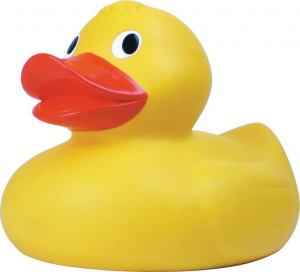 Please bring your sold and unsold Duck Race tickets so that we can finalise the Duck Race. 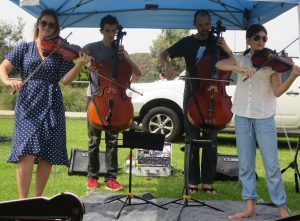 Our December Markets featured special buskers The String Family, ambassadors at our 2017 Busking Festival. The December market on Thursday 28 December was the biggest ever. Chris reckoned it was an all-time record for the gate, never having topped $2,000 before. We had 112 sites occupied by 77 stallholders. It was a huge effort by Chris and the team who marked out, purchased and organised food, staffed the gate, did the barbecue and sold great tucker from the van. A special thank you to the Doyle family who also helped out in many ways. We also had a very successful day selling duck race tickets. Michael and Ang with great moral support from Mal & Judy, and Peter & Julie Hartley sold more than $1,000 worth of tickets; a wonderful achievement. Lynda Ord encourages as many Rotarians as possible to come along and support the Australia Day Award presentations on Thursday 25th at Club Narooma at 6pm. 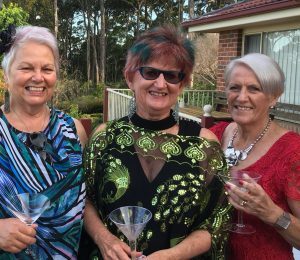 This is a new venue and time for Narooma’s celebrations. It is also a prestigious time for the Club because at the ceremony President Bob will publicly present the 2018 Rotary Tertiary Scholarship to Alicia Bate. Some of our members will also be singing in the Community Choir. Super duck sellers Michael O’Connor, Iris Domeier and Frank Eden at Narooma IGA. Our race judges have now declared all 1,000 ducks fit and ready for racing in our annual Australia Day Duck Race. This is a great relief to all Rotarians who all uphold the Four Way Test, especially ‘Is it fair to all concerned’. After the judges’ scrutiny, we can definitely say ‘yes’. Race organiser John Doyle said the 1,000 ducks will be launched from the bridge about 10 on the 26th and then proceed downstream towards the finish line at Apex Park boat ramp where judges and stewards will have taken up position. ‘We’re hoping for perfect weather, good crowds and a quick race,’ he said. The first duck across the finishing line wins $1,000. The last duck wins $100. Proceeds will go towards Australian Rotary Health and the Club’s Tertiary Scholarship fund for students from Narooma High. Donations will also be made to Narooma Surf Club in appreciation of their assistance and to Bermagui CRABS (Cancer Research Advocate Bikers) who lend us the ducks each year. Narooma Motors will again host its Annual Car Show on Saturday 27th, this time on NATA Oval. We will be helping out with the food van. Peter and the Narooma Motors crew have invited as many car clubs as they could and entry is free. The gates open to entrants from 7am. For non-entrants the gates open from 9am. 2EC will broadcast from 10am. Entrants close at 12.30 so judging can be completed by 1.30. Prizes will be handed out before 2EC’s Kimmy Saker departs at 2pm – 10 trophies and cash prizes. There will be face-painting, balloons and a jumping castle for the kids, prizes and giveaways. The last hoorah will be a ‘supercruise’ around town, on a route yet to be finalised, for those who wish to take part. Chris O’Brien reports the Markets on Sunday 28th, the last Sunday in the school holidays, promises to be even bigger than the December markets. John is ensuring we have all hands on deck so will be doing a ring-around for the few empty roster slots.